Fences are a necessity and the first thing that people see when visiting your home. Not only do you want a fence that looks good but one that is also both functional to meet your needs, as well as being considered wildlife friendly fencing. Fences provide privacy, security, property markings, safety, and decorative accents to your landscape. Fences, particularly split rail fences are also commonly used to separate ranches and farms, enclose pastures, and keep livestock from straying. Living in Colorado, a state that is full of all kinds of wildlife, we have to take things to the next level and consider what types of fences are safe for wild animals. 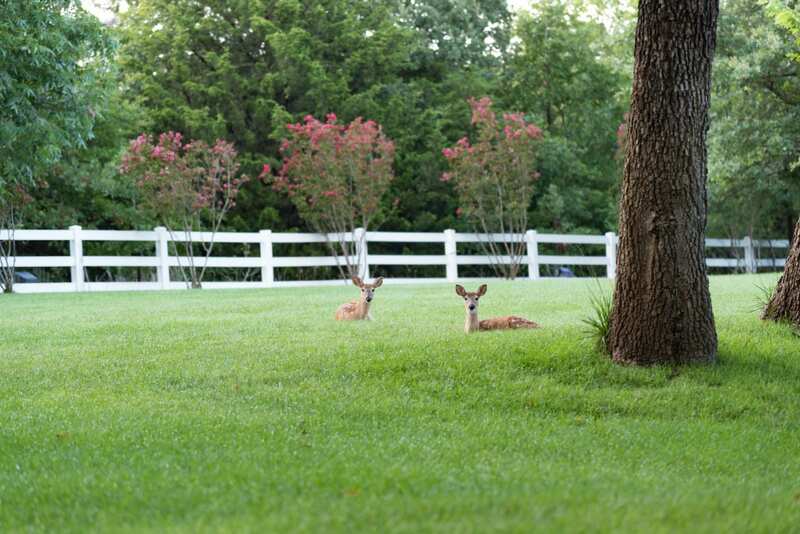 Certain types of fences can create fatal hazards for elk, deer, and bear. If you live in an area where wildlife frequents your yard you should consider using split rail fence. Wildlife can easily be caught and entangled in other types of fences which leads to severe injury, even death. Split rail fences can prevent such occurrences. If you do not need to completely keep animals in or out of your yard split rail fence is a great solution. Most wildlife can safely jump over split rail fences allowing them to continue their movement without danger to themselves or causing you costly repairs. You can take the average split rail fence a step further to ensure wildlife safety by using a drop rail configuration. By dropping one side of the top rail on random sections of fence, it will provide an even easier place for wildlife to pass. Wildlife is smart and if your yard is in their usual pathway, they will quickly learn these panels exist. You can study footprints and watch their travels to see where it makes the most sense to drop the rail. There are several Colorado parks that use split rail fence for the purposes of managing wildlife. Rocky Mountain National Park is visited by thousands of people every year. Many of these visitors travel Trail Ridge Road. Areas of this well used route through Rocky Mountain National Park are lined with split rail fence. Taking the Trail Ridge Road from Estes Park will ascend 4000 feet in a matter of minutes. This means that this area is full of moose, elk, and deer. Split rail fence helps keep them off the road by providing a deterrent. It also causes them to stop before jumping the split rail fences and running out into roadways giving drivers more time to spot them. Moose are very prominent in the area and as they munch greenery along their journey, they are often oblivious to cars. Split rail fences prevent thousands of collisions between these beasts and automobiles every year. Due to the success of split rail fences keeping wildlife safe, many other state and national parks have adopted them. Preventing unnecessary deaths due to hazardous fencing should be a goal for all Colorado residents and nature enthusiasts. So, by using split rail fences on private land and supporting the use of split rail fences on public land everyone can do their part to keep our precious wildlife thriving.